I posted this picture to my instagram account and a lot of friends asked for the recipe. I thought I would do a quick post. I teach this in my healthy baking workshop and students are usually quite surprised at the soft texture which I believe is largely due to pumpkin puree. So this is a recipe that has very little fat, I used vegetable oil, but feel free to use melted butter in the same amount. I’ve used powdered organic jaggery for sweetness. I love using garam masala to bake with, for one it is easily accessible on the kitchen shelf and has great depth of flavour due to the blend of spices over a single spice like nutmeg (to which I am very partial) or cinnamon. Sift the flours with the salt, baking powder, baking soda, garam masala powder and set aside. Mix in the grated carrot and pumpkin with the flour. Preheat the oven to 180 degrees Celsius and grease a 9 inch loaf pan / baking pan. Beat together the oil, egg, pumpkin puree. Add the jaggery/ brown sugar to the wet ingredients and whisk till well mixed. Add the flour mixture to the wet ingredients in 3 batches and fold in gently. Bake for 45-55 minutes or till a tester comes out clean. Cool in the pan for 10 minutes and transfer to a wire rack to cool completely before slicing. 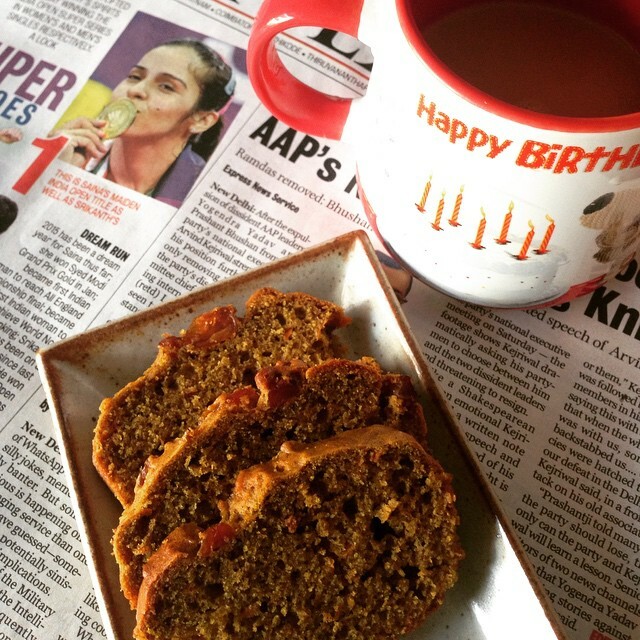 jaggery loves fruit / vegetable dense cakes and ragi in small measures really lends itself well. Do let me know how this turned out for you.